Hello! Today I'm back with another Born Pretty Store review. 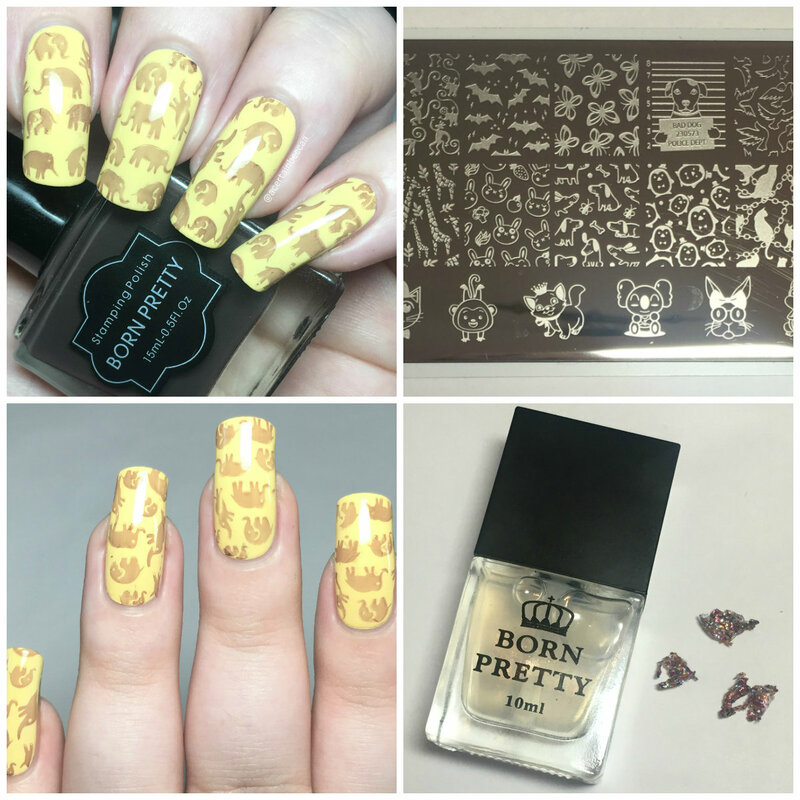 It has been a fair while since I reviewed Born Pretty items, with my last post being back in April (you can see that here). 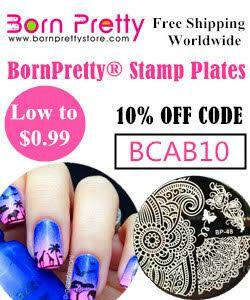 This time I have three different items to show you - a stamping plate, a stamping polish, and a peel off basecoat. Read on to find out more! First up is the stamping plate. I was sent plate BP-L063 (item #39486, online here), a rectangular plate full of animal images. There are so many cute patterns that can be used so many different ways. The elephant image on the top right hand corner was the first to catch my eye. 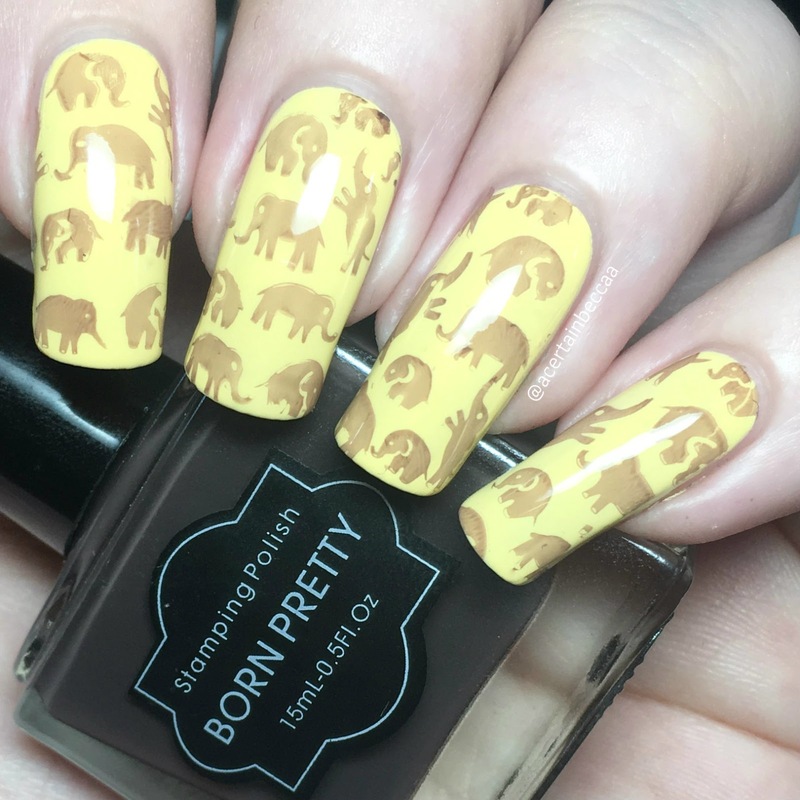 I thought it would pair perfectly with Born Pretty's dark grey stamping polish (item #37021, online here). 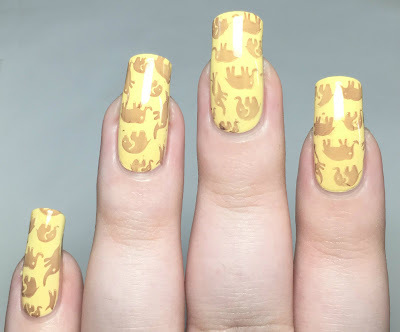 I stamped over a soft yellow (swatched here). The stamping polish was a bit more on the brown side than I expected, and slightly thinner than the others I have tried, but still picked up and transferred well to my nails. Lastly, I was also sent a peel off basecoat (item #39350, online here). I find that peel off basecoats work best under glitter, so I layered it under a full coverage microglitter. While the polish did not remove in one solid piece, it did peel off nicely, making removal quick and easy. I also only let it dry for an hour, so it should become more solid over time. What do you think? The stamping polish may not have been quite what I expected, but I do really like both the plate and the peel off base. The peel off base coat I am currently using is much more expensive, so it's nice to have a cheaper option.